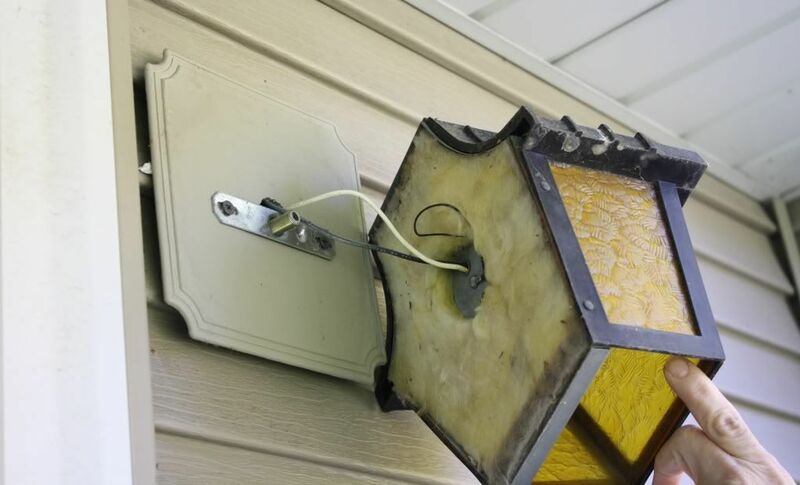 Take, for example, our old porch light. Yuck. And Halloween-esque black fixture with yellow glass that casts a creepy glow all across the lawn. Oh, and it doesn't match ANYTHING in or on our house. It's such a small part of our home's facade, but it sticks out like a sore thumb (especially when it's lit up!). We knew it would be a simple change that would really make the front our house look better. Fortunately, the Electrician Extraordinaire (aka my mom) helped us make the switch! And by that I mean "made the switch for us while I handed her screwdrivers." Once she had the old light down, she found out all the gizmos (that's the technical term) she would need for the new light were already up there. So it seriously took her about 5 minutes to go from the witch-of-Halloween-past to this beautiful new welcome-to-our-happy-and-totally-not-scary-home light. And here it is all lit up. And not yellow. Beautiful. Do you have any small changes that could make a big impact in your home? Love the new fixture; makes a huge difference! Makes me want to head outdoors and assess. Funny how those little changes are thebones that so often get postponed! At least for me. :) but wow, that new lamp looks amazing! Not sure who originally thought it would be a good idea to cast thick ugly yellow glow across the entryway but i see it all too often! Lol. I agree, it's funny how those get skipped, and they are usually so simple! :) Thanks for stopping by!